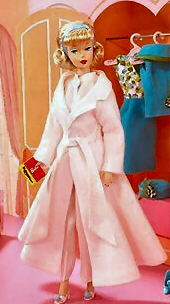 2007 Sleepytime Gal Vintage Barbie Reproduction is a reproduction of an American Girl Barbie Doll and two vintage ensembles - Sleepytime Gal #1674 (1966-1967) and Fashion Editor #1635 (1965). 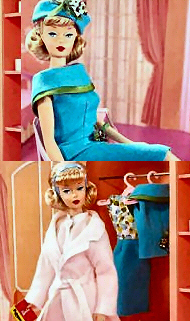 The display box is inspired by Barbie's vintage Dream House. It is a Gold Label edition, with no more than 5900 dolls produced worldwide. This fun set includes reproductions inspired by the original accessories: pink open toe mules with blue pompoms, a comb and brush set, retro hair rollers, bobby pins, and a “book” — all essential items for some much-needed R&R! In the closet hangs the Fashion Editor reproduction complete with pillbox hat and turquoise spike closed toe heels.